The skin in this "BLENDED FAMILY" is SUPER sensitive! 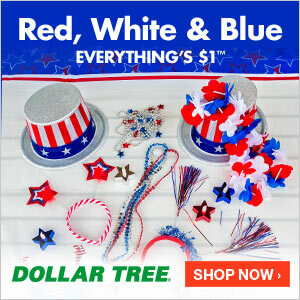 All product for this review/feature was sent free of charge by the company. I was not offered any monetary compensation by posting my honest opinion about the All Products. I'm marrying a man who has super sensitive skin (literally), and who also has a son with just as sensitive skin & allergies to plenty of things. We really have to be careful with the products we use around & with him. On top of that, MY youngest son has sensitive skin with scented clothing detergents and especially scented fabric softener. I found that out the hard way, after spending a day in NYC with a baby covered in head to toe with a rash, from the fabric softener we had used on his clothes. Needless to say, I bought a onesie for him from a store in Time Square, got the "scented" clothes off him and bathed in as soon as we got home and he was fine. But I never made that mistake again! We've used dye free, scent free products ever since! But to say that we have SENSITIVE skin in this house is an understatement...and as we "BLEND", understanding this is super important with helping make things work smoothly for all of us (making our transition into one family easier). 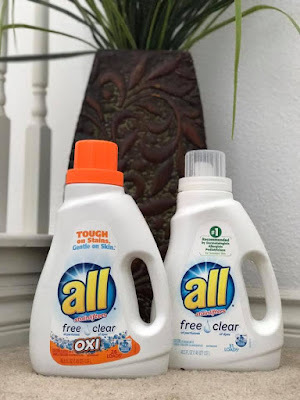 BELIEVE IT OR NOT, they sent us The "ALL FREE AND CLEAR" products for review, and upstairs in our laundry room, we have the "FAMILY SIZED' container already half gone (because it's our GO TO laundry detergent). I actually giggled when I pulled the product out of the box (when it arrived), because it's exactly the same product we ALREADY use! 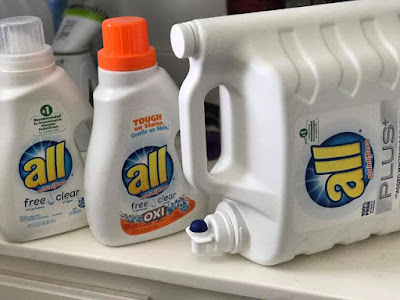 We typically buy the "family sized" bottle, because we are washing clothes for eight people all...week...long! 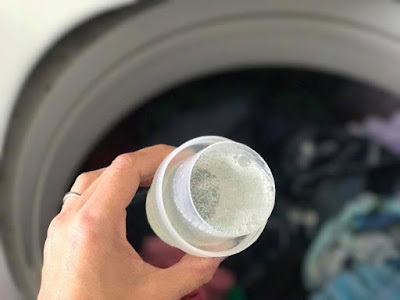 The thing I love about this All "FREE AND CLEAR" detergent is that it's great at cleaning the clothes, yet we have never had a reaction from using it, because it's free of dyes, scents and finishers that could cause us all to RASH OUT. 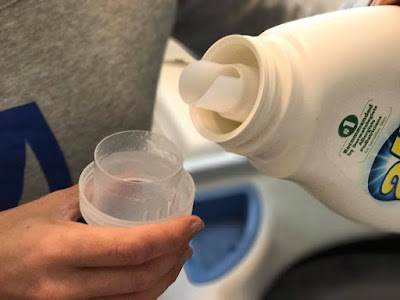 Our clothes come out ODOR FREE & clean, because it does a great job washing...and the All Free and Clear with Oxy Clean is also great not only for clothing, but also for our carpets (where the kids wrestle and sit) and even upholstery (meaning our spills on the couches, etc. can be easily cleaned up using this product too). Especially ones that work well with our "blended family's" needs! Plus, with a baseball player getting grass stains on his paints and crushed in dirt...we love the OXY product in the wash, to help things come out bright & white again! 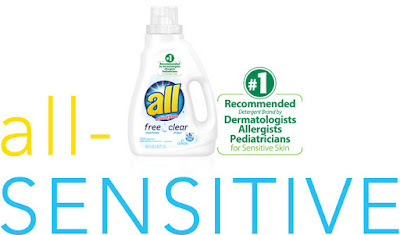 It’s the #1 Recommended detergent brand by dermatologists, allergists and pediatricians for sensitive skin. All "Free and Clear" is our washing machine's BEST FRIEND...and everyone in our house can tell you, their skin appreciates it too! CLICK HERE to learn more about All Free and Clear products! If you're a family with sensitive skin, you might really consider trying it too! Sometimes COSTCO carries it in the "family size" (that's where we got ours) and it lasts and you won't be worried about running out right away! We love that too, because trust me...we do plenty of laundry every single week in this house!